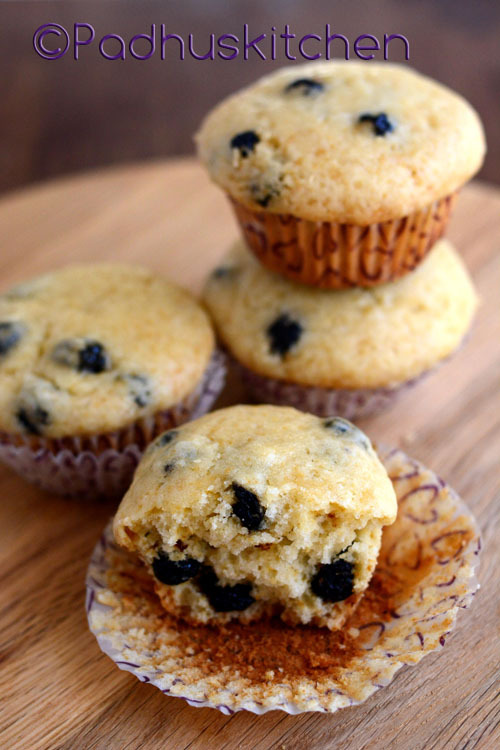 These delicious blueberry muffins are great for breakfast or as a snack any time of the day. Fresh blueberries are best for this recipe but as I could not get fresh ones, I have used dry blueberries for this recipe. 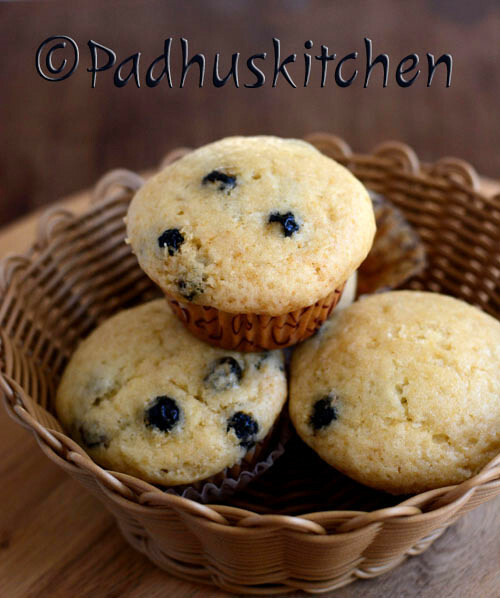 Let us learn how to make blueberry muffins following this easy recipe. Sieve together all purpose flour, baking powder and salt. Pre-heat oven to 200 degree C for 10 minutes. Line muffin cup with muffin liners or grease and flour muffin cups. Beat egg well. Add vegetable oil, vanilla essence, warm milk and mix well. Mix flour mixture (flour + baking powder + salt mixture) with powdered sugar. Now add the egg mixture to the dry ingredients and mix well. If the batter is too thick, you may add 1-2 tbsp of milk. Fill muffin cups till the top with the batter (picture below). Bake in a pre-heated oven at 200 degree C for 20-25 minutes or until a toothpick inserted in the center of the muffin comes out clean. Enjoy as a light breakfast or as a snack any time of the day. Note - Fresh blueberries are best for this recipe. As I could not get fresh ones in my place, I have used dried blueberries. I am looking for any cakes or muffin with wheat flour .. is it available in this site ? Hi! Can I substitute the egg with curd. Would love to make them for a friend who is vegetarian. Try substituting 1/4 cup of plain yogurt for 1 egg. If the curd is too thick, thin it with a little water. Thank you for your quick reply. Will definitely try them asap and will let you know how it turned out.